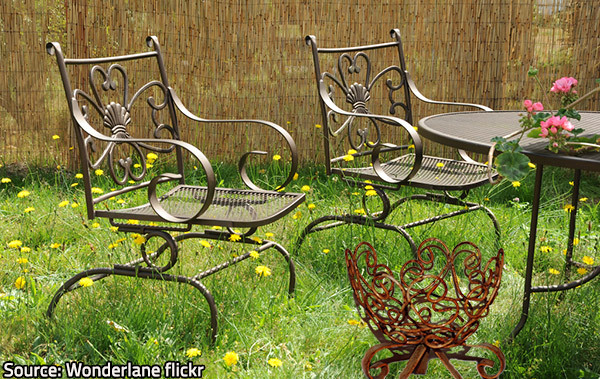 Metal outdoor furniture takes a lot of abuse from the whims of the weather but with proper care you can preserve its unique beauty for many years. 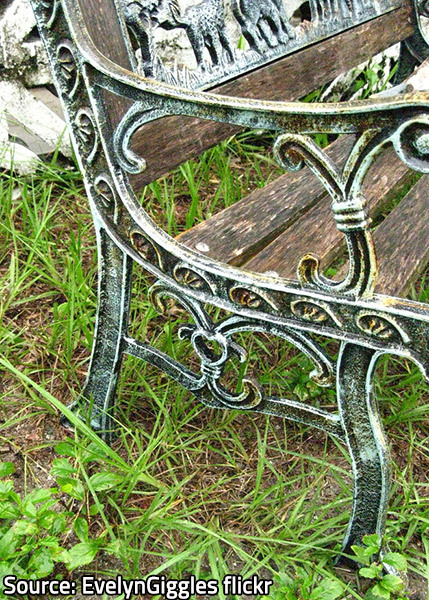 Metal furniture, especially when wrought iron is involved, can be a sophisticated work of art. The malleable material allows the creation of intriguing shapes and delicate ornaments whereas its sturdy look and feel suggests reliability and endurance. Yet, durable and adorable as metal pieces are, they are prone to scuffing and rusting with time. 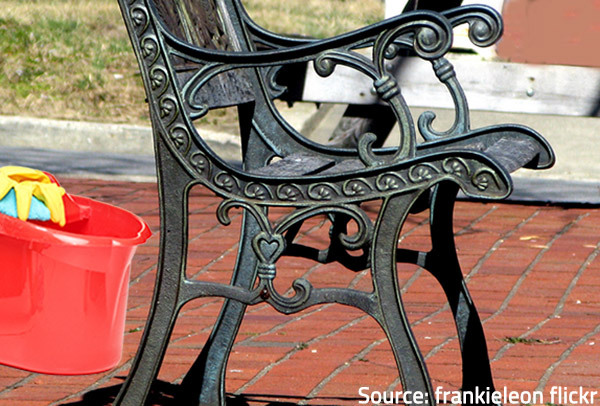 Proper care is required to avoid any damage or signs of wear and tear, particularly if your furniture is placed outdoors. So, if you possess an exquisite set of metal deck furniture, make the little efforts necessary to maintain it in good condition and you will be able to enjoy it for many years and even to pass it down to the next generations as a treasured and unique family heirloom. Oxidation is the most common threat for metal pieces, so you need to take adequate measures to prevent it. Therefore, keeping your furniture dry and clean should be your top concern. 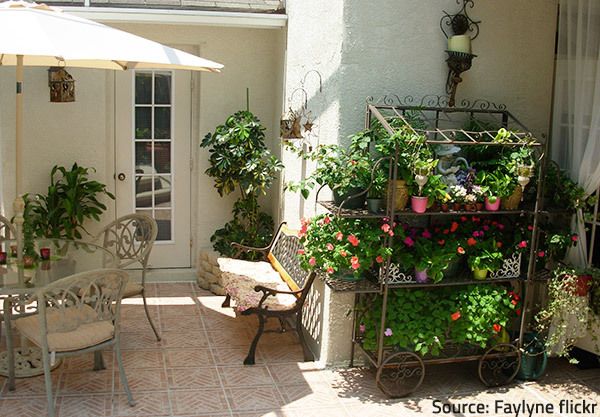 Clean your metal deck furniture regularly and it will add charm and convenience to your patio. The first thing you can do to provide suitable protection for your pieces is to have them coated with car wax so that rainwater will form beads over the surface and will not soak into the metal. This will greatly reduce corrosion. Then, think of the best ways to shelter your furniture from adverse climatic conditions. Storing it indoors during winter months or in the events of heavy and continuous rain is highly recommendable to prevent extensive weathering and staining. If this is not possible, at least provide efficient covering. Placing vinyl furniture covers over the metal pieces is your best option but tarpaulin will also do the trick well enough. You can always use old sheets or quilts, of course, but they will provide protection only against dirt, not moisture. Remember that covering your furniture is advisable not only during the cold season and in cases of storm and rain but whenever you are not going to use your pieces for a longer period of time. Cleaning your pieces frequently will help preserve their flawless condition and natural luster. 1) Remove spills and debris immediately to avoid stains that are difficult to clean. Wash gently your exquisite metal pieces on a sunny day to preserve their luster and charm. Let your furniture dry in the sun or wipe it dry (make sure to fully dry any pieces of fabric – cushions and/or coverings – before placing them over the metal pieces). 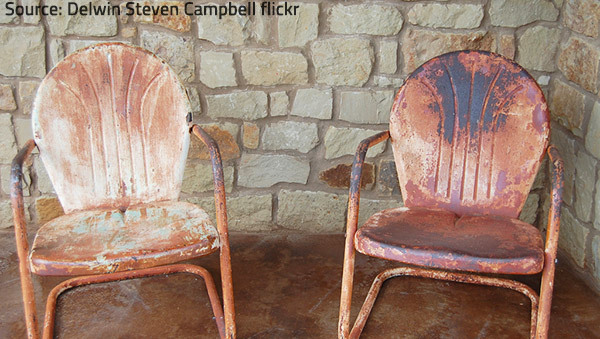 You need to sand off rust in order to restore the delightful look of your metal pieces. You can wipe all the surfaces with a rag dampened in penetrating oil to provide better protection from moisture. However, if oily residue remains on your items, they may collect dust and dirt with time, so consider spraying the treated parts with a suitable rust inhibitor which is not sticky and dries completely. 4) If your furniture has already sustained greater damage, use a wire brush first and then sandpaper to completely clean the spot. It is recommended to spray the area with a metal primer. Allow it to dry fully before painting over the spot, if at all necessary. 5) To remove oxidation from aluminum furniture, rub the surfaces with a mixture of white vinegar and water in equal proportions. Rinse well and let dry. 6) Apply a protective coat – automotive paste wax provides the best preventive measure to keep rust away for long. Let it dry for several minutes, then remove any residue and polish the surface with a clean soft cloth. Provided that you follow the above cleaning and maintenance tips, you won’t need to refinish your metal pieces for a long time. Removing rust requires much elbow grease and careful approach. Is it worth the efforts and the money? 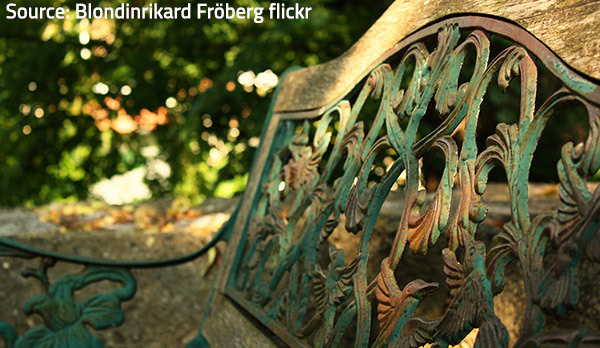 Refinishing metal furniture can cost you a lot of time and money. If your pieces are rusted to the point that there are holes in them, or if they have no aesthetic or sentimental value, replacing them with new furniture may be the more beneficial alternative. Just make sure to keep it clean and dry in the future. Both elegant and practical, metal furniture is a worthy investment. A beautiful set of metal patio furniture will not only enhance the appealing look of your home but will also provide you with the means to relax outdoors when the weather is nice. In general, very little maintenance is required but if your metal pieces wear out with time due to the abuse they take from the climatic conditions and extreme temperature fluctuations, they may need refinishing. Then you can resort to your creativity and add a personal touch to your home décor.